From the get-go, it is clear that Cielo focuses on, for lack of a better term, the “user experience”. And what an experience it is. After being served an aperitif in a shot glass by the ground-floor hostess, she invites you to enter the elevator, which brings you to the 23rd floor. The elevator opens up to a deck with a lap pool and a panoramic view of the Kuala Lumpur city skyline. It becomes apparent then that owner Werner Kuhn, chef and proprietor of several other dining establishments, has struck pay dirt again. There is a private dining hall to one side, and a hostess welcomes you to the two-storey restaurant, perched on the roof of a commercial building on Bukit Ceylon. Within, a constellation of lights hovers above the bar, which overlooks an extended dining area that is open on three sides to the night view. The main terrace dining area is on the second floor, which can be accessed via a staircase. It is gasp-worthy, and has a white theme — white-topped tables and chairs, and a wooden deck. 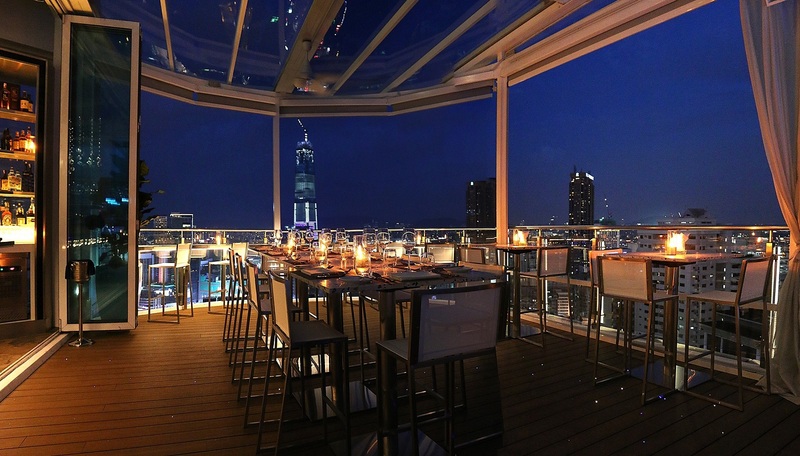 The roof can be retracted on fine nights, for an almost open-air dining experience high above KL, perfectly befitting its name. Dining beneath the stars, and with a spectacular view, trumps gilded banquet halls and elaborate decorations every time. 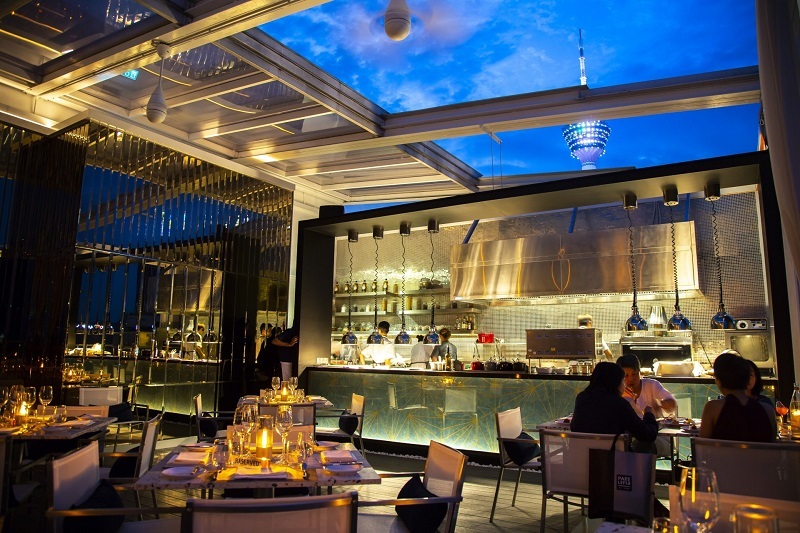 Cielo is elegant and classy without being stiff or pretentious. This is the sort of place where you dress up for dinner, to bring that someone special for serious questions or silly chatter. Indeed, on the night I was there, guests were well dressed, with the expected over-representation of couples. Hostesses are attired demurely in dark blue while waiters are in vests, and the service is excellent, in particular from Aizzar Mansor, the restaurant manager, who gave me helpful recommendations. A wine list crammed with selections from various parts of the world complements the food menu, which focuses on seafood, although there is a non-seafood selection as well. The seafood comes from various sources worldwide, from Pantai Remis tiger prawns to Patagonian toothfish from France. All seafood are served either charcoal-grilled or steamed. 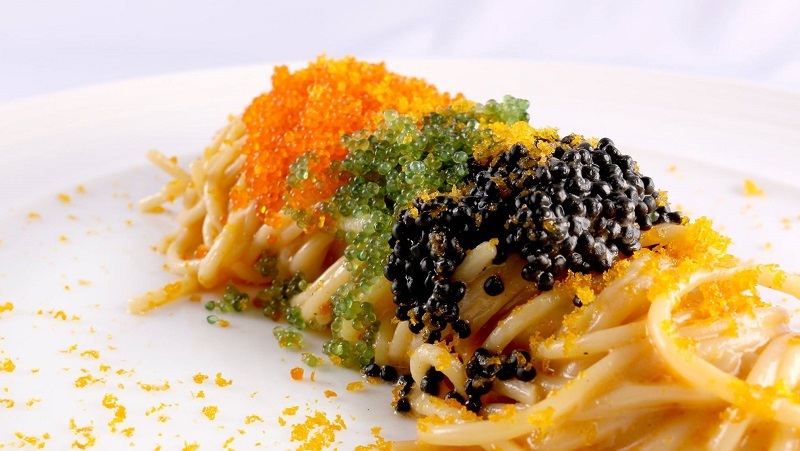 There are caviar and live oysters to start with, and a four-course degustation menu for RM298++. My meal began with the house-made table bread with saffron butter. This was followed by my starters — the Akami Tuna Tartare (RM68) and Pan-seared Scallops (RM52). 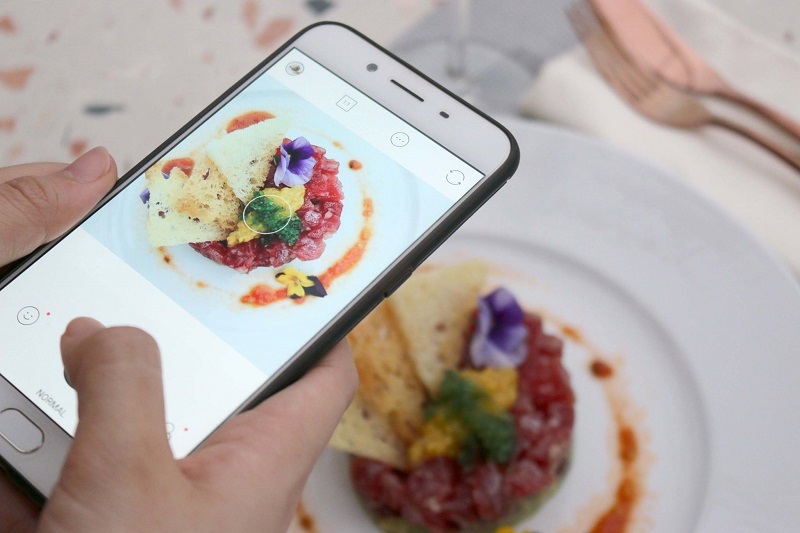 The former was a layered pancake of colours and textures that was fresh and velvety rich, with cubed tuna and avocado-kyuri salsa contrasting with the lively mango salsa and tomato vinaigrette. 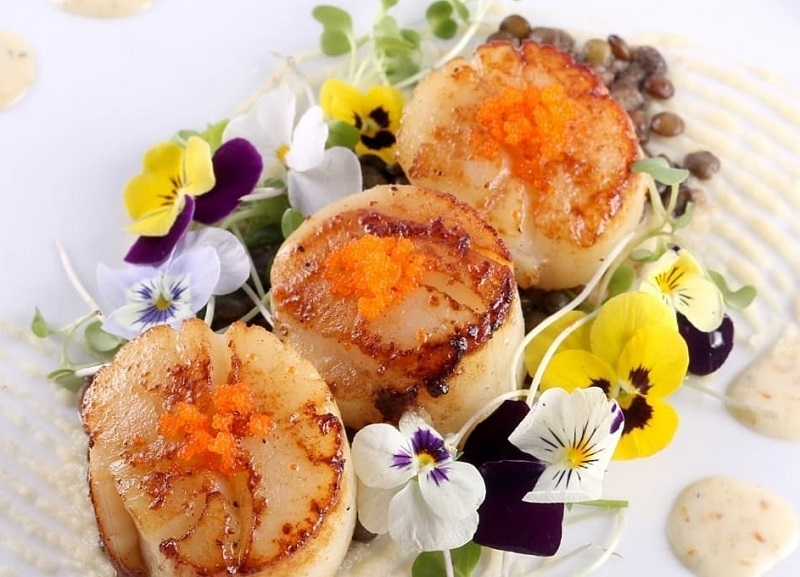 The latter starter was even better — the lightly grilled scallops were a standout for their succulent, firm texture and natural sweetness, enhanced by lentils with tomato confit, celeriac mousse and a tobiko and tahini dressing. Table lamps, replacing candles, made for an intimate atmosphere as dusk deepened into night. KL’s skyline looked glamorous, highlighted by colour and light, disguising the vulgar details visible in daylight. I am partial to the Monkfish (a euphemism for the unlovely Anglerfish) and was not disappointed with La Lotte (RM120) from Brittany, France. I had it grilled, three lovely chunks of meaty fish with carrots, courgette slices, onions and baby tomatoes in mousseline potatoes. There is a choice of five accompanying sauces for their seafood, of which I tried the Lobster Cream and Tarragon Lemon Butter. The cottony portions of firm white fish were mouth-wateringly good, even when not paired with the creamy, slightly piquant Tarragon Lemon Butter while the Lobster Cream was intense, full-bodied with an almost nutty, chocolatey flavour. The Spaghetti Boutargue Cire D’Abeille (RM89) — a Cielo Favourite Classic, and the only pasta dish — was saturated in bisque sauce with lobster butter sprinkled with Arenkha caviar, wasabi tobiko, orange tobiko and bottarga, which are tiny pearls of contrasting, exquisite flavour to offset the decadently rich pasta. Deceptively simple, but so good. Fifteen minutes’ preparation yielded the small Chocolate Lava Cake (RM36) — thin-shelled and oozing rich, hot, deadly delicious chocolate, paired with green tea ice cream, mango coulis, matcha salt and scattered fruits. The small Salted Caramel Cheesecake (RM36) was more than it seemed, a wafer of almond brittle on cheesecake topped with salted caramel, for a not-too-sweet, thick, creamy cheesecake with the richness of salted caramel. A meal is more than just flavour and presentation; it is the entire experience, for food is perceived to taste better if the other senses are pampered as well. Cielo understands this, that the whole can be much more than the sum of its parts, and it orchestrates the dining experience and makes it special. The setting is romantic, the food superb, the service impeccable, and the ambience enough to thaw the frostiest of companions. Cielo Sky Dining and Lounge, 23-01, 1D, Vida Bukit Ceylon, Jalan Ceylon, KL. 03 2022 1798. Tues-Sun, 6-11.30pm; bar closes at 1am.